Home Share Providers are home owners who have a home, yet struggle to keep up with ownership expenses such as a mortgage, taxes, insurance, and maintenance costs. They need a trustworthy tenant that can reliably pay below market rate monthly rent. This steady income allows home owners to avoid foreclosure and have enough money to live. Many home providers have stated that having a long-term renter has enables them to achieve greater quality of life goals. Plus, the companionship is often a welcomed bonus. Longest Home Share match is 6 years to date! Have a home you would like to share? We encourage you to apply for our program! Click the application image to download it to your computer. You may print it and complete the answers by hand. The forms MUST be opened with Adobe reader. Can’t download? Get Adobe reader here. Home Share is not a financial assistance program and funds are not distributed to participants. Instead, Home Providers benefit from access to Renters that have applied to the Home Share program and meet program requirements. 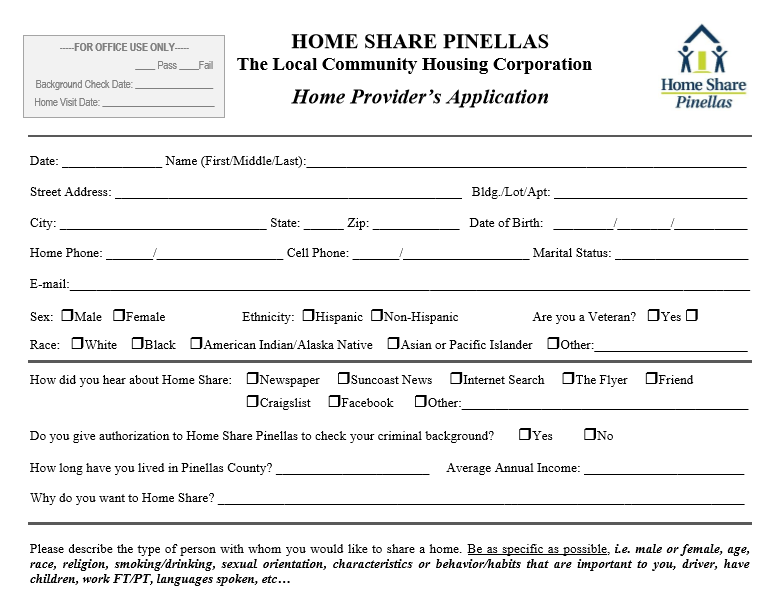 Home Share Pinellas staff provide administrative and support services to help Home Providers be matched with Renters. If you are looking for more financial freedom and have a quality home that has a space for rent, we encourage you to apply to Home Share. We have Home Providers all throughout Pinellas County.